Online website that promotes The Best of the Best in Arts, News, reviews, updates on Art from around the Globe. How we can make a Differences? What is your impression of the first official portrait painting of Duchess of Cambridge – Kate Middleton? Creativity flows through our Life? For a painter being a daily observer of life in light & colour; a sculptor in the shape of things; a poet in words; a musician in sound. What’s true for you? How to increase our creativity? GANDHI’s TEN STEPS TO HAPPINESS? BUDDHA’s Most Powerful message for Self Healing? The month of January celebrate the anniversary of Barbara Hepworth birth, as a group we want to visit her work both drawings & sculpture to base our opinion about her work that you admirer most. Secondly the work that you would like to add to our list of famous works of art!! 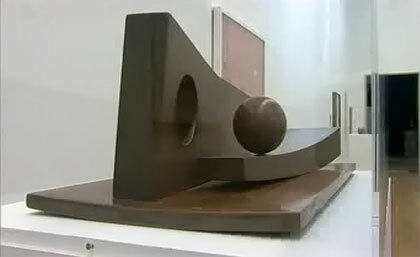 Peter Filzmaier •I am intrigued by Hepworth’s semi abstract and abstract creations. from “Doves” to “Ball Plane and Hole” her work evolves through the century and mirrors a time when art was for arts sake and sculptors like her and Moore led a trend affecting all media. Some of my favorites are; “Infant”, “Two Heads”, “Pierced Form” and “Mother and Child”. The afore-mentioned to me, define the three-dimensional aspect of sculpture which entices the viewer’s perspective around the entire work. Didier Dubuy • Nearly impossible task to choose anything from this great Lady. Her love & respect for the material whatever she chose to work with is so high! Marbles, woods, reveal their inner qualities, veins, structure through smooth shapes & polish..Then voids come through to animate, to complete the material, managing corridors as if it was just made to be sensuality enjoyed but gone through, beyond. Most emblematic maybe would be her works with strings; “Delphos” 1955 (my favorite), “Elegia” or “Gothic”. I love everything; 30’s rigorous shapes & 20’s figurative works with solid plastic ( pre-Columbian remembrance?) too..
Sunil Vilas • Barbara Hepworth’s life story is divided into two tales the first half being influence by working together with her first husband John Skeaping known for his bronze and wooden sculptures, his theme he like working with was in the form of animals and mainly horses. We are able to trace the changes in her work from the earlier influences in the 30’s. And in the second half was with the artist Ben Nicholson who played a major role for her influence in working with abstract geometric shapes. Who also brought about the biggest change in the direction for her work was when from 1932, he visited Paris with Hepworth and met Picasso, Braque, Brancusi and Arp. On Subsequent visits to Paris in 1933 and 1934 they met Mondrian and Moholy-Nagy. All these contacts and meetings with all the masters that we know of today, help to shape the style and work that we all appreciate and admirer in her work today. 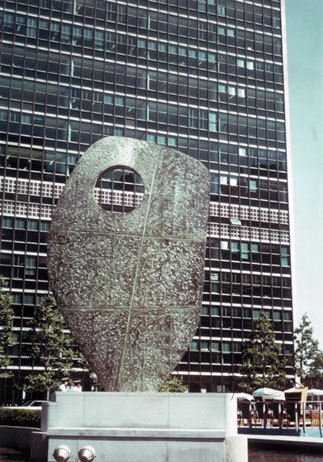 My favourite that I love and is a symbol of what she stood for The Queen of sculptor is the commission Title: Single Form Bronze, 1961–64 (BH 325), United Nations Building, New York maybe this is where perhaps “Art help to shape the World that we live in today”. A good lesson to understand from this is a artist’s, are also a painter, sculptor, photographer, potter and craftsman.., Picasso I would say lead the way by experimenting with all the medium available to his talent and the opening his mind to all creative art forms to complete some of the finest examples that we appreciate in National galleries around the world. Didier Dubuy • Thanks a lot Sunil for these information’s; Didn’t knew she was in relation with Nicholson, an artist whom I personally cherish. Nor she met Brancusi whose influence is obvious in 1935/36 works. What about relations with Henry Moore ? Sunil Vilas • Linda thank you for your input perhaps you could add your personal comments that you could share with all the members of the group. As artists and creative thinkers we have to relate to all the past masters or even current living artists of how they affect or inspire us today! 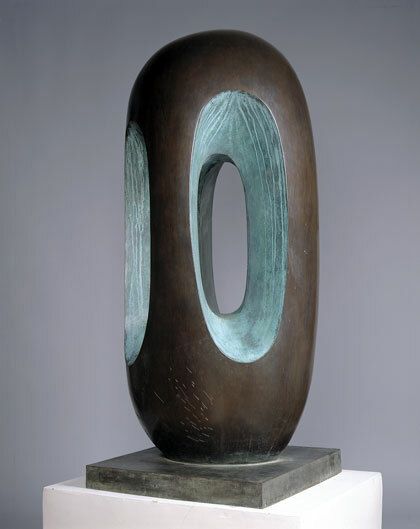 Barbara Hepworth (1903-75) was born in Wakefield on 10 January 1903. Her father, Herbert Hepworth, would become County Surveyor and an Alderman. She trained at Leeds School of Art (1920-1) and while on a county scholarship at the Royal College of Art (1921-4) she met the painters Raymond Coxon and Edna Ginesi and sculptor Henry Moore. Hepworth was runner-up to John Skeaping for the 1924 Prix de Rome, but travelled to Florence on a West Riding Travel Scholarship. After visiting Rome and Siena with Skeaping, they were married in Florence on 13 May 1925 and moved to Rome, where both began carving stone. In November 1926, they returned to London. Links forged through the British School at Rome with the sculptor Richard Bedford (a curator at the Victoria and Albert Museum), ensured that the collector George Eumorfopoulos visited their studio show in 1927 and bought two works by Hepworth. 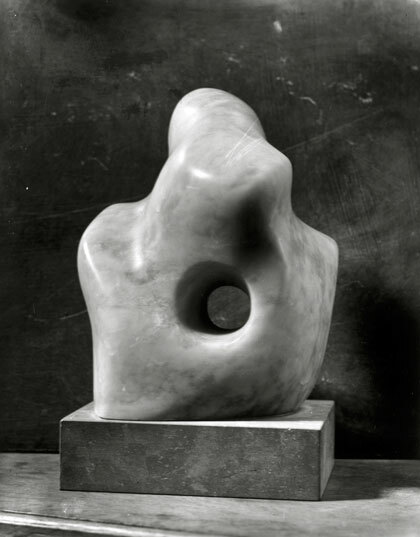 The couple moved to 7 The Mall Studios in Hampstead in 1928 (where Hepworth remained until 1939). With Bedford and Moore, Hepworth and Skeaping became leading figures in the ‘new movement’ associated with direct carving. Successful joint exhibitions in 1928 (Beaux Arts Gallery, London and Alex. Reid and Lefevre, Glasgow) and 1930 (Tooth’s) consisted of animal and figure sculptures in stone and wood. They joined the London Group and the 7 & 5 Society in 1930-1. A son, Paul, was born in August 1929, but the marriage was deteriorating and in 1931 Hepworth met Ben Nicholson (then married to Winifred Nicholson), who joined her on holiday at Happisburgh, Norfolk. She and Skeaping were amicably divorced in 1933. 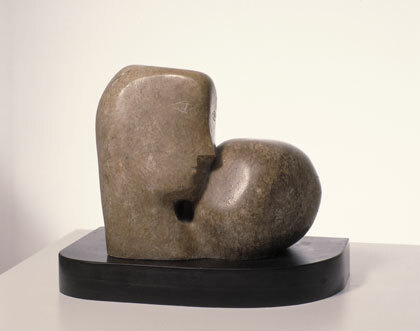 In 1934 Hepworth gave birth to triplets and Hepworth married Nicholson four years later. Hepworth and Nicholson revealed their move towards abstraction in joint exhibitions in 1932 (Tooth’s) and 1933 (Lefevre). This became the abiding direction of her work, epitomised by the pioneering piercing of the block, which coincided with experiments in collage, photograms and prints. Establishing links with the continental avant-garde, the couple visited the Parisian studios of Arp, Brancusi, Mondrian, Braque and Picasso. They joined Abstraction-Création, and were major figures in Paul Nash’s Unit One grouping and the associated publication edited by Herbert Read (1934). In 1935 they were instrumental in restricting the 7&5 to abstract work, thus paving the way for a fertile period of constructivism enhanced by artist refugees from totalitarian Europe (Gropius, Moholy-Nagy, Breuer, Gabo). This culminated in the publication of Circle: International Survey of Constructive Art (1937), edited by Nicholson, Gabo and the architect Leslie Martin, designed by Hepworth and Sadie Martin. Such utopianism was curtailed by the war and Hepworth with Nicholson evacuated to St Ives, Cornwall. They stayed with Margaret Mellis and Adrian Stokes at Little Park Owles, Carbis Bay. Domestic demands and lack of space restricted Hepworth to small sculpture and painting until, on moving to Chy-an-Kerris, Carbis Bay in 1942, she secured a studio. 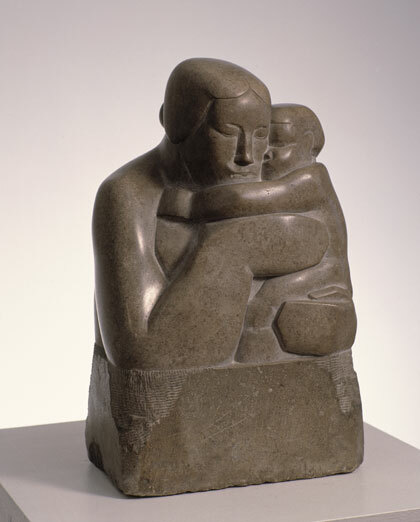 Her first major solo exhibition in 1943 (Temple Newsam, Leeds) was followed by a monograph by William Gibson (Barbara Hepworth: Sculptress, 1946). Hepworth became prominent amongst St Ives artists, forming a focus in 1949 for the establishment of the Penwith Society of Artists with Nicholson, Peter Lanyon and others, and helping to attract international attention to the group’s exhibitions. 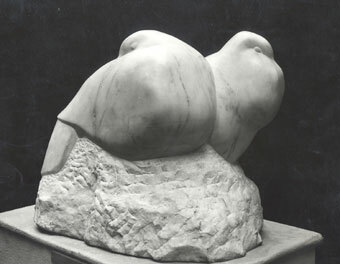 Although Hepworth’s contribution to the 1950 Venice Biennale was dogged by comparisons with Moore, two retrospectives – in Wakefield (1951) and London (Whitechapel 1954) – and Read’s monograph (1952) confirmed her post-war reputation. She bought Trewyn Studio, St Ives in 1949, where she lived after her divorce from Nicholson two years later. She visited Greece in 1954 in an effort to recover from the sudden death of Paul Skeaping (1953). 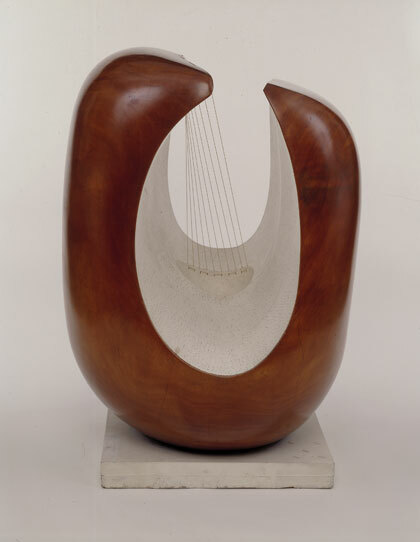 Hepworth was especially active within, and on behalf of, the modernist artistic community in St Ives during its period of post-war international prominence. Her experience of the Cornish landscape was acknowledged in the choice of titles for her works. In a wider context, Hepworth also represented a link with pre-war ideals in a climate of social and physical reconstruction, exemplified by her two sculptures for the South Bank site of the Festival of Britain (1951). If you would like to participate in our topic kindly use the form below all comments will be reviewed by our panel.., if accepted will be included. I’m surprised why this accident failed to came to exist earlier! I bookmarked it. want to encourage you continue your great work, have a nice holiday weekend!